Eco tours. 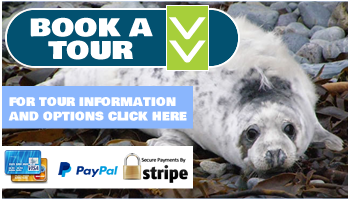 marine tours, wildlife tours, boat tours, Dingle Bay, Kerry, Ireland. 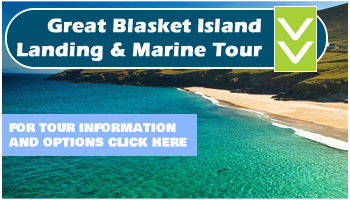 Welcome to Blasket Islands Eco Marine Tours, your Irish wildlife tour specialist for whale watching and dolphin and bird watching trips on the Dingle Peninsula,Co Kerry, Ireland. 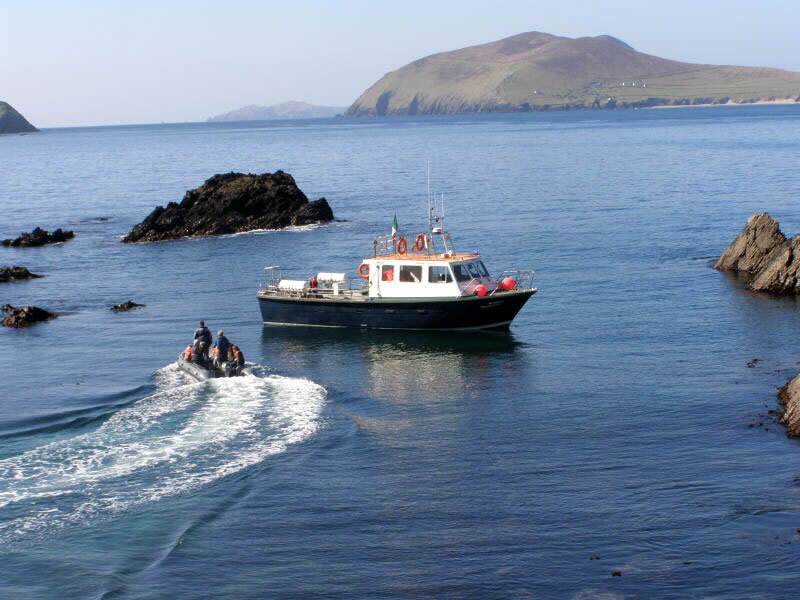 Here, in the spectacularly beautiful Atlantic waters of Dingle Bay, we regularly encounter at least five species of cetaceans (whales and dolphins), with porpoises, common dolphins, bottlenose and risso’s dolphins and minke whales the most frequently observed species. Orcas (killer whales) can occasionally be observed in passage, and humpback and fin whales show up in these waters in the late summer and autumn months. Our eco tour will take you below the breathtaking cliffs below the Slea Head Drive and the towering Cathedral Rocks of Inis na Bro, where we regularly come up close to the world’s second largest fish, the giant basking shark. 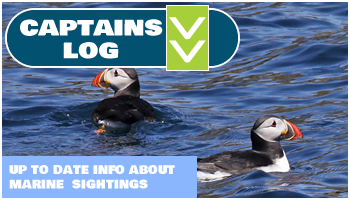 We visit the remote islands of Inis na Bro, Inisvickalaun and Tearaght where tens of thousands of migrating seabirds nest during the summer months, amongst them puffins, Manx shearwaters and storm petrels. Diving gannets, coming from their 25000 pair strong colony on the Skellig Islands, lead us to the fish-rich feeding grounds where they share their prey with foraging whales and dolphins. The Great Blasket Island and its smaller neighbour Beginish are home to a colony of about 700 grey seals. Their inquisitiveness and curiosity brings them close to our boat when we approach them on our trip around the islands. The Eco Marine Tour will be leaving from the harbour pier in Ventry village (Ceann Tra), situated at the head of a magnificent 2-mile-long sandy beach. Village facilities include a shop, post office, café/potterry, restaurant and pub. 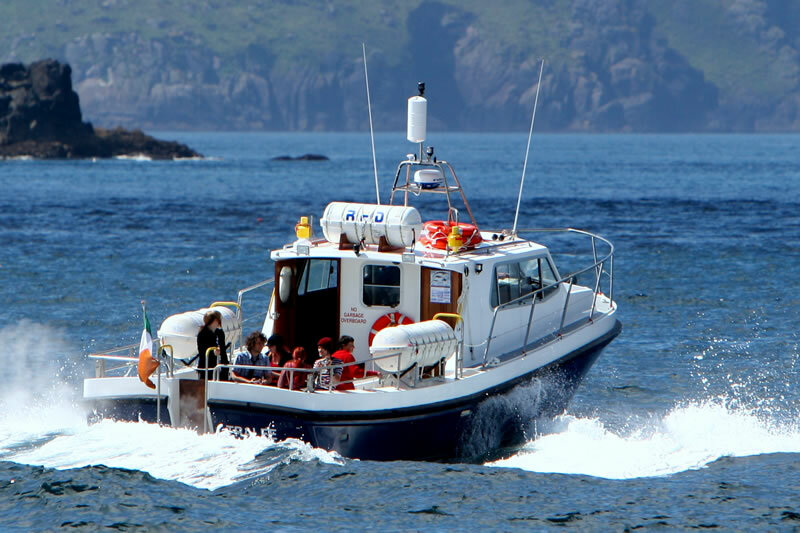 A 43ft Aquastar with a flying bridge for perfect wildlife viewing, is skippered by Mick Sheeran. 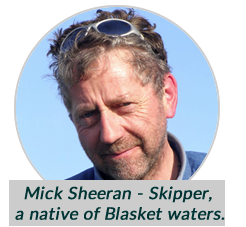 Having lived on the Great Blasket Island and spent most of his life fishing and taking passengers to and around the Blaskets, he has acquired an in-depth knowledge of the area and will design every trip individually according to the wildlife distribution and the prevailing weather and tidal conditions. A wildlife guide on board will answer any questions about wildlife encountered on the eco tour. The MV Blasket Princess is fully approved by the Dept of Transport and has all necessary safety, communication and navigational equipment. It has a marine toilet and inside seating for 20 passengers. Check TOURS for schedule, pricing and booking info Come west along the road and leave your worries behind. Welcome Aboard !